On a Thursday night Arirang SoundK interview, Tiger JK and host, singer Esna, made it a mission to get Bizzy speaking. 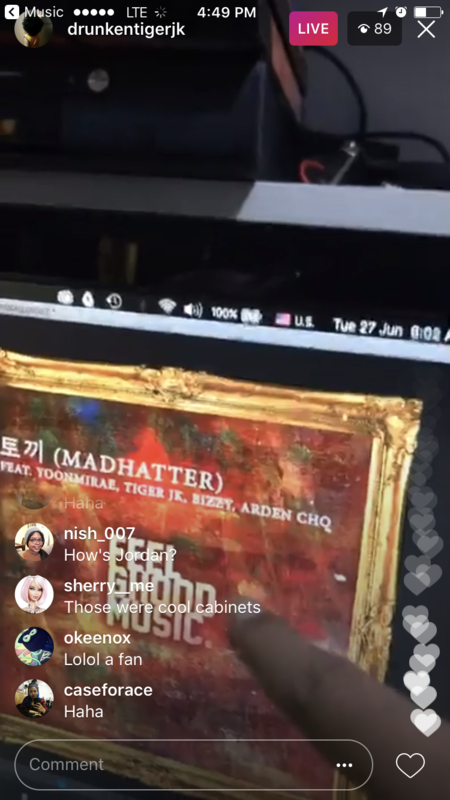 While it was apparent fans were missing YoonMiRae, Tiger JK filled the void with his “Michael Scott” like jokes and by poking harmless fun at partner, Bizzy. We find out Bizzy actually was a babysitter, and that despite Jordan calling him uncle, Jordan is weirded out by Uncle Bizzy. However, as things got crazier, JK decided to play Bizzy’s next single, which is due to debut next month. Upon noticing what JK was doing, his own manager comes in to give JK the glare so as to not to spoil the single. But don’t worry! We have it on tape for you! The hilarity starts circa 1:06. Bizzy’s single starts at 1:47. We get a bit of the hook before MFBTY’s manager gives him the side eye. The full interview is a real treat for Bizzy fans, who as he said, spoke more than his usual. For JK fans, it’s worth it just for the laughs.